Why would you want ANSI impellers that have not been through a dynamic balancing process? ANSI centrifugal pumps are not very energy efficient compared to some other types of pumps. Even under ideal conditions as much as 40% of the energy going into turning the shaft is wasted. Plus with the bearings supporting the shaft on one end and the impeller doing the work on the other end, it’s easy to get “fishing rod” style shaft whip. In addition, when the pump runs off its curve, it really wants to dance because of unbalanced hydraulic forces. These pumps sling the process fluid, they don’t scoop it. When things get out of balance, it’s bad for bearings, seals, and energy efficiency. What you don’t want on top of this is a mechanically unbalanced impeller. There are two types of balance in the pump world, hydraulic and mechanical. Hydraulic balance is achieved when you are operating at the Best Efficiency Point (BEF) on the pump performance curve. It means that Force equals Pressure times Area is roughly equal and opposite in every direction. Mechanical balance is exactly like the tires on your automobile. Unbalanced tires wear fast, make for a rough ride and consume additional energy because they do not roll smoothly. Every impeller from Steel Toe Group (STG) is dynamically balanced. 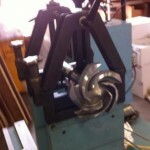 Full-size (untrimmed) impellers arrive at the warehouse balanced. 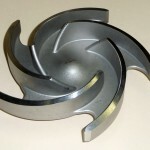 When required, impellers are trimmed in-house and then dynamically balanced. That’s it. If you get an impeller from STG, it is balanced.